An examination of a "culture at a crossroads" I Never Thought I'd See The Day shows us the 10 signs that our America is in trouble! Dr. David Jeremiah shows us a new spin on Atheism, how Persia went from a protector of the Jewish people to persecutor, the reduced influence of the Bible on the Church of today and other very important topics Christians, and our culture are facing. "...the big question Christians are asking:” says Dr. David Jeremiah "What do we do in light of the devolution of society around us? When we ask the question in that way, we betray a misunderstanding of the problem. We mistakenly think the problem is outside us-that it originates with the non-Christian population. We sometimes adopt the attitude of the Pharisee who prayed, “God I thank you that I am not like other men-extortioners, unjust, adulterers, or even as this tax collector"(Luke 18:11). 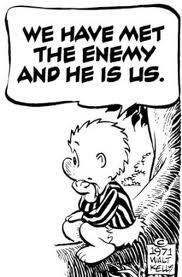 The truth is, we can echo the words of Pogo in the old Walt Kelly comic strip: “We have met the enemy and he is us!” ..."
I did enjoy this book and think that is has definite relevance to our world today. I believe Dr. David Jeremiah gives an accurate account of not only what is happening in our culture today but also what the Bible has to say about it. I was raised in a Christian home, went to a Christian school and was taught on a weekly if not daily basis that these things would take place in my lifetime so my question is: How did a man who has been in the ministry for more than five decades really never think he would see the day when these things would take place? That is really my only question concerning this book and I would love the opportunity to ask Dr. Jeremiah just that. Not as a point of accusation (because I have to admit even though I truly believed I would see the day these things would come about I haven't always lived in a way that would prevent it) but rather to gain his insight as to how we as Christian can so often mislead ourselves about Biblical timelines and events much like the way teenagers all too often believe themselves to be immortal, and impervious to physical harm. If I get the chance to talk with him about it I will most definitely share his answers with you! I found this book to be a very interesting read. My favorite chapter was chapter 8: When a Muslim State Could Intimidate the World. I learned a few things I did not know and was able to get answers for a couple of questions I have been asking and studying about for a while now. In addition to that, I was quite pleased that Dr. Jeremiah did not follow in the footsteps of the authors of "In The Fight of Our Lives. (A book that if you remember did not get a good review from me...if you do not remember look through the blog and read my review.) Dr. Jeremiah instead took me on a journey of education as to the history of Persia and the Muslim religion in that region of the world so that I now have a better understanding of history. He also chose to end that chapter with stories of how God is reaching people in that region of the world and how they are turning to Him for salvation. He chose to inspire his readers to hope instead of condemnation. "While many are coming to Christ through the showing of films like The Passion of the Christ or The Jesus Film, there are dozens more stories of people who are being brought to Christ through dreams." I really enjoyed this book and believe it would make a great sermon series or it might be better in a small group setting as I believe this book lends itself well to challenging its readers to think and discuss. I leave you with a verse from Hosea, a verse that Dr. Jeremiah also chose to quote in his book.